Work on your business… not in your business. Good bookkeepers are hard to find. And once you’ve found a bookkeeper and invested your time and resources into this person, how do you know that they will be reliable, accurate and trustworthy? Watkins and Company is able to mitigate your risk by providing dependable bookkeeping services and guaranteeing the work. At Watkins and Company we know that you didn’t start a business because you wanted to spend all of your time matching receipts to statements and writing checks to pay bills. You have better things to do…like running your business. Watkins and Company has developed a team of highly skilled and efficient bookkeepers that can deliver the financial statements you need in less time and at a better price. We know how to streamline bookkeeping and accounting practices so you’re able to have a clear picture of your financial position. We offer monthly or quarterly bookkeeping services depending on the scale and needs of your business. Watkins and Company has everything you need for a fixed monthly price that makes sense for you. “Focus on your strengths” is frequently-heard advice, and a small business owner always benefits from doing that. If you need help with bookkeeping, that’s where the experts at Watkins and Company CPAs can help. The value of a CPA becomes clear quickly when you start a business relationship with Watkins and Company. From basic bookkeeping services to more advanced financial planning, it’s all about understanding your business’s financial picture and how it can be improved. With monthly consulting as the recommended approach, you can have a quick, clear picture of your financial position to help you get your business where you want it to be. 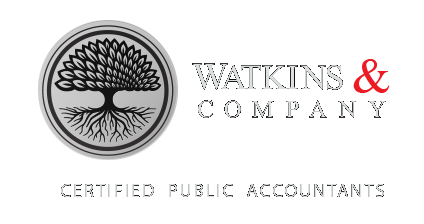 Contact the skilled professional CPAs at Watkins and Company through this website or by phone to put our expertise to work for you.